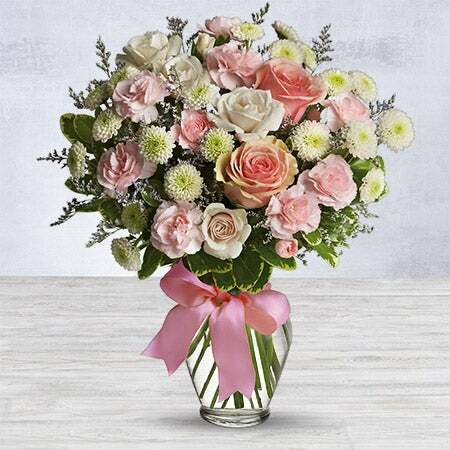 This beautiful arrangement is as sweet as cotton candy and is as delicate as... a bouquet of flowers! Pretty shades of pink and white blooms accentuate femininity, making this an ideal way to sweeten up her day. Pretty pink roses, spray roses and miniature carnations, white button spray chrysanthemums, lavender limonium and green pittosporum fill a spring glass vase that's wrapped with a pink satin ribbon.